I try not to be sad around Father’s Day, but I am. I miss my dad. A lot. Sometimes I pull out old VHS tapes of him and watch them. They bring a rush of emotions that flood my soul to the core. They make me laugh, they make me cry. I’ve tried for days to write a post about him and for some reason the words wouldn’t come. 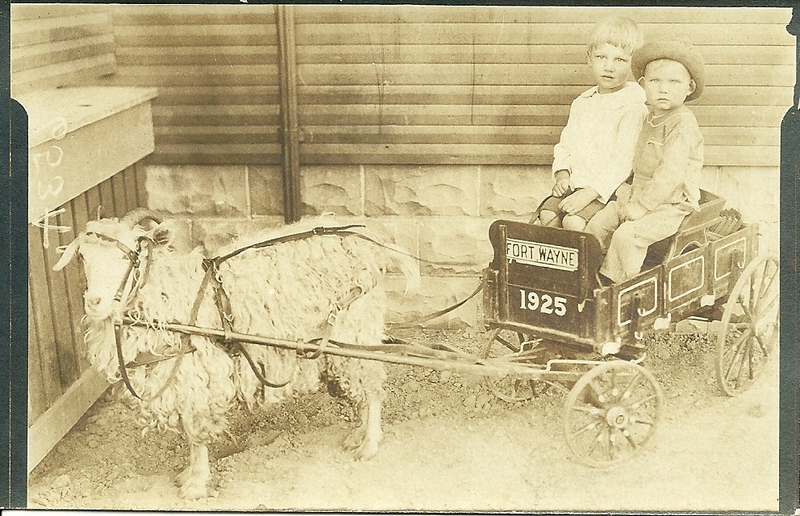 My dad (on the left) pictured with his little brother. My dad died in May of 1994 and sometimes it’s hard to believe he’s been gone for twenty-one years. I can hardly believe it’s been over 20 years since I’ve seen his face, heard his laugh, hugged him, or heard him speak. Sometimes I worry that I’m forgetting him– his voice, his face, his mannerisms. I don’t ever want to forget. I had a good relationship with my dad and I have no regrets and I’m grateful for that. He died at what I think is an early age–72. I’m sad that my sons were so very young when he died and never got to know him. My oldest son was only 4 years old and he has very vague memories of him. 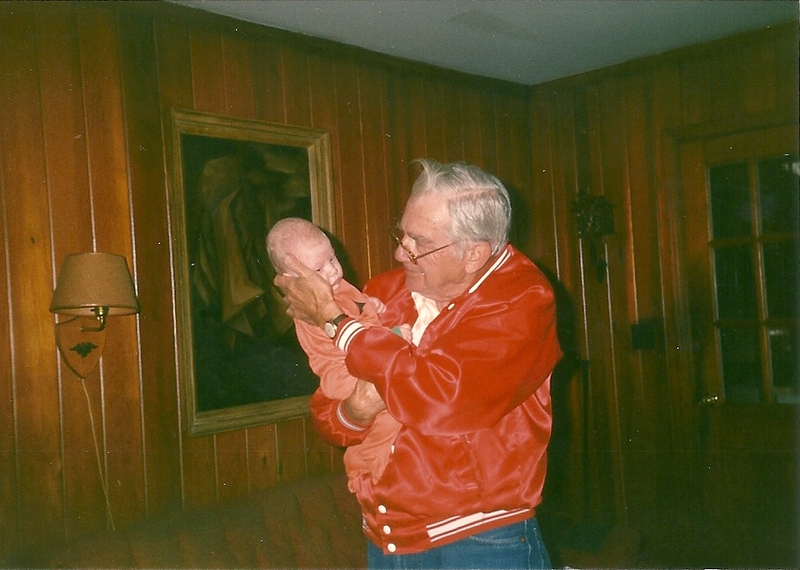 My father with my oldest son who was ~6 weeks old. My youngest son doesn’t remember his grandfather as he was only 18 months old when my dad died. I’ve written before that my father was diagnosed with metastatic colon cancer at the age of 70 when I was pregnant with my youngest. He had a massive stroke on the operating table during his surgery for that cancer. His surgery, which was supposed to last at the most 2 hours, left us sitting in the waiting room anxiously awaiting news from the doctor, some four hours later. Finally, my mother and sisters and I heard the words no family member wants to hear– that our beloved husband and dad just wouldn’t wake up. When they were finally able to rouse him, they noticed a one-sided weakness and so they sent him for a CT scan which confirmed he had suffered a stroke. The stroke affected both his mind and his body and my father was never the same. His advanced cancer unfortunately caused him a lot of pain and he was bedridden for much of the last two years of his life. I’ve also written about how I used to lay my bald-headed infant son in the bed with my father. 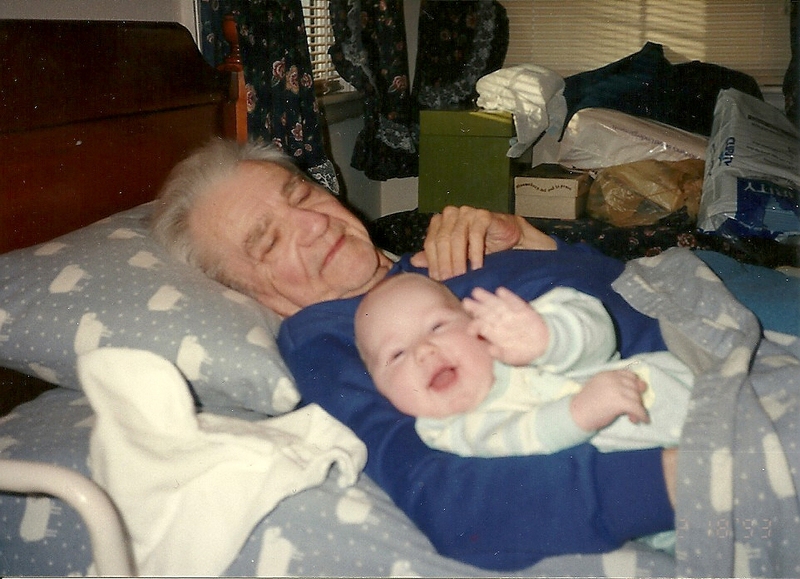 I remember my dad’s smile as he would lay in bed, stroking his grandson’s bald head and talking to him. I think my son helped bring him some extra happiness and took his mind off of the terrible pain of cancer that not even morphine could squelch. My youngest son snuggling with Paw paw at age 3 months. When I think of my dad, the one thing I always remember about him is how kind and gentle he was. That was without a doubt his legacy. He loved animals and people. He taught me that while life will not always be kind to me, that I am to be kind regardless. It was a life lesson he taught to me over and over by example. He was a wise man. I never felt safer than at night sleeping in the bedroom next to my father. Hearing him snore in the next room told this young girl that all was right in the world…. that I was safe. As a small child, I remember my dad teaching me to swing on my swing-set. I remember he kept trying to teach me the concept of “pumping my legs.” I remember sitting on that metal yellow swing at dusk one night as he was trying to teach me and being so puzzled by what he meant by the term– “pump your legs.” He sat in the swing beside me and showed me and then stood in front of me and grabbing my short legs, and moved them through the pumping motions. What can I say, I’m a slow learner. I finally got the hang of it and I can remember how we stayed outside swinging after dusk and until the moon appeared that night (I remember I kept telling him I wanted to swing just a little while longer) and how my mother had to call us in for dinner. I can still see the moon shining through the neighbor’s tall trees like it was yesterday. That is such a clear memory for me and one that I will always cherish. I was sad during my teenage years when that old rusty swing set had to come down. And those neighbor’s tall trees that the moon was shining through? They were long ago cut down. I remember my dad teaching me to ride my bicycle without the training wheels on the driveway of our home and in the backyard. I was scared and I crashed and burned and skinned my knees countless times. But every time I crashed, he told me I was okay and to get up and get back on that bike, that we were going to try again and we would do better next time. He was ever so patient and supportive. He cheered me on and in no time I was riding that bicycle like a pro. I also remember my dad teaching me how to drive a car. 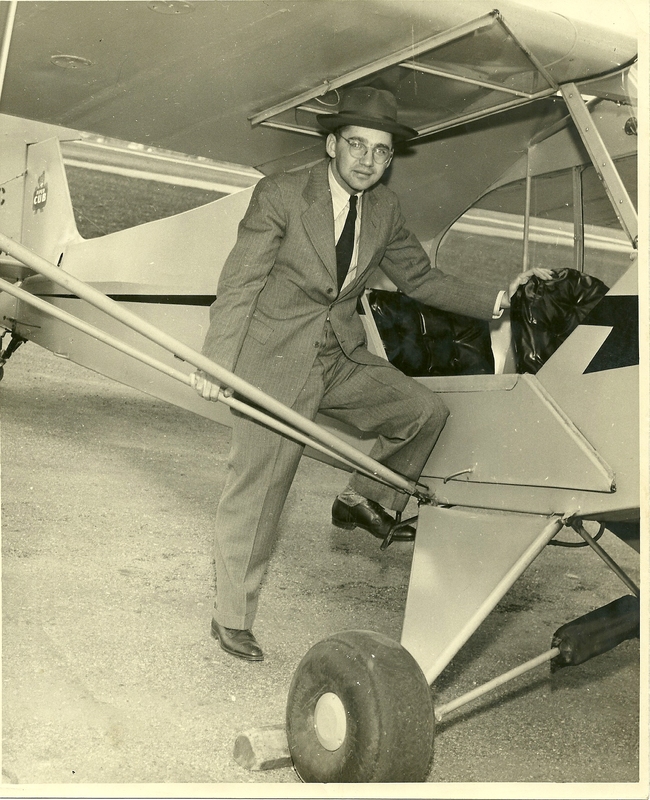 I learned to drive at Berry Field Airport– the local airport my father worked at (he was a pilot). I guess not many people can say that they learned to drive a car at an airport. I loved going to work with my dad. It was great fun watching the airplanes take off, and getting to explore the hangars, watching the mechanics, and occasionally getting to crawl up inside the jets. Our dad was a flight instructor and an all around good teacher. That small airport we learned to drive at? It’s now Nashville International Airport or BNA (Berry Field Nashville). My dad at age 16 and the year he made his first solo flight. I remember my dad taking our family to Gatlinburg, TN and the Smokey Mountains when I was a little girl. It was in the mid 60s. It was on this trip that I saw my first black bears and had my first taste of honey. We ate at a little restaurant on the Gatlinburg strip (I think it was called The Honey Pot or something similar…. I know it’s no longer there). 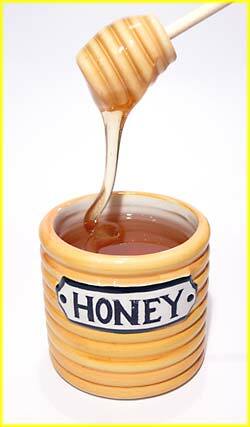 Each table had a small honey pot with a drizzle stick. While we were waiting on our food to come to the table, my father drizzled some honey into a spoon and gave me a taste. I was hooked for life. I still remember that sweet taste of heaven like it was yesterday and I remember walking up and down the Gatlinburg strip visiting the various shops there that night after we ate. Besides Gatlinburg, there were many more family vacations that bring me fond memories. I still remember the trip to Florida and how happy it made my father to introduce his three young daughters to the ocean. He had a daughter on each hip and one on his shoulders. And after playing in the ocean I remember burying him in the sand and building sand castles with him. Our family vacations were very simple and certainly nothing fancy but we made happy memories and those are memories I wouldn’t trade for all the money in the world. 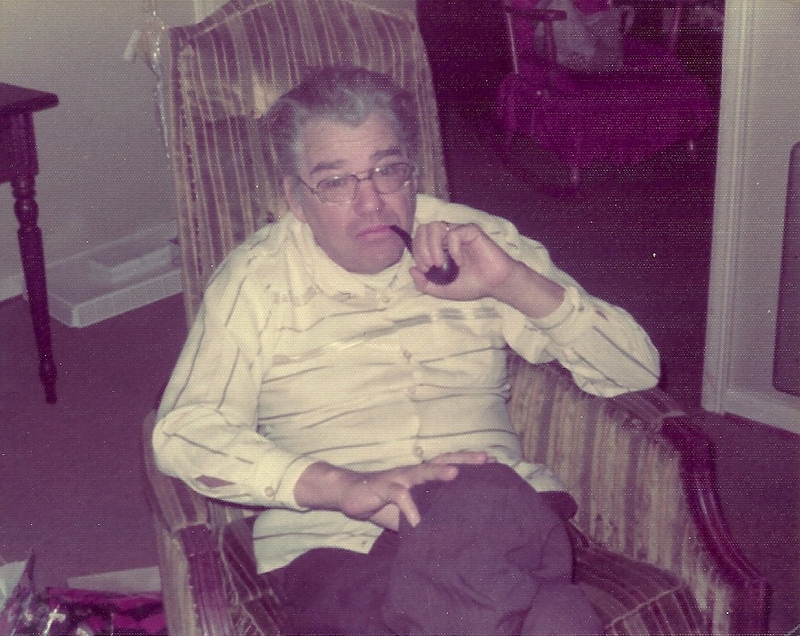 My dad loved to cook… both in the kitchen and outside on the charcoal grill. He may not have been the best cook by any means, but he sure loved it and it made him happy. He had two ways of cooking meat on the grill. Charred black or rare. I must have inherited his grilling skills as grilling has never been my forte. I’ll always remember him smiling and singing in the kitchen though when he cooked and when he grilled. It’s something that made him happy. When I was 15, I had my first car date. I remember my dad not caring much for the boy I went out with. This puzzled me and I didn’t understand it. This boy was clean-cut, dressed very nicely, was polite to my father, etc. My dad was polite back to him, but I could tell he was not warming up to my date. I went to my mother one day and asked her why my father never liked any of the boys I dated. She laughed and explained to me that NO boy would ever be good enough for his little girl. She told me her dad was the same way, and that most dads were like that. I got it then. It was funny when years later, my dad took an instant liking to the boy I dated who would later become my husband. He was thrilled when I married him and gave us his blessing. He loved my husband like a son until the day he died. I said a prayer today on Father’s Day for my dad. I miss getting him a card, I miss spending the day with him, I miss getting advice from him, I miss smelling his pipe tobacco, I miss his laugh, I miss just being with him. I even miss the burnt hamburgers he would grill out for me. I wish every day that my sons could know him. I wish more than ever that their first airplane rides could have been by their grandfather. It would have thrilled him to have been able to take them up. Sometimes I see bits and pieces of my dad in both of my sons, but especially my oldest son. He has many of my dad’s physical characteristics– his thick eyebrows, his lips, and his ears. And I often hear his laugh in my son’s laugh. That same son inherited my dad’s love of aerospace and went on to get his undergraduate and Master’s degrees in aerospace engineering. I don’t think that was a coincidence. I thank God for giving me the father he gave me. 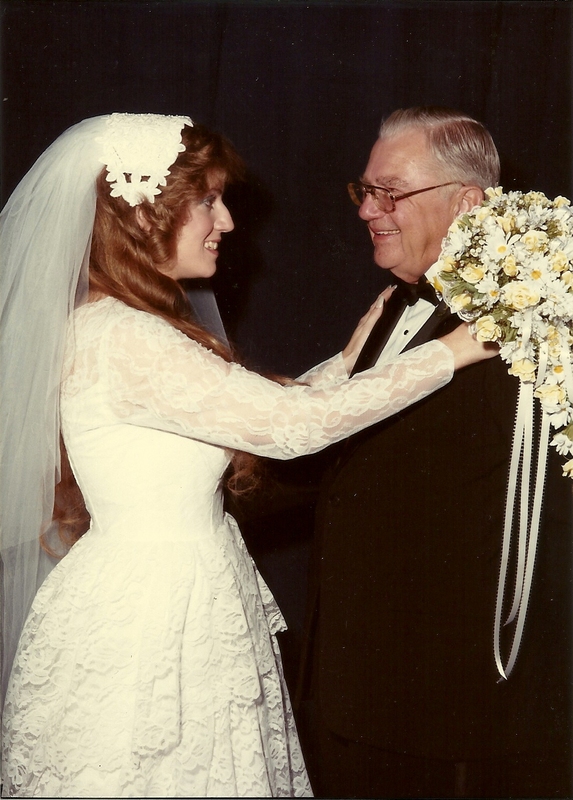 I am grateful I had a close relationship with my father and I’m grateful for all he taught me. This entry was posted in Family, Memories and tagged blessings, Cancer, childhood, Family, Father's Day, fathers, gratitude, Happiness, memories. Bookmark the permalink. Where has your blog gone????? Oh my, I just got so tired of talking about me, me, me! I should’ve switched over to fiction writing, but I just didn’t do it. Sorry! Well, it’s never too late! I hope you will continue to write!! A beautiful loving tribute to an amazing man and father. My thought and prayers to your dad. I know he is smiling in heaven knowing how much he is loved, celebrated and remembered. In many ways, he reminded me of my dad, and just like you, I value the many life examples, events, lessons and memories he shared with me and my 5 other siblings. In our hearts, we celebrate our dads everyday. In our hearts everyday is Father’s Day. Thanks for your comments. I guess I’ll never stop missing my dad, but like you say, in my heart, I celebrate him every day. Have a wonderful rest of the week and weekend.